How Do I Add a Minister to Payroll? This tutorial guides you through the process of adding a minister to the Payroll application. Because a minister has specific setup information that is different from a regular employee, this tutorial guides you through selecting the appropriate options for a minister. The following steps walk you through adding a minster to the Employee Information page. This includes adding information to the Employee Information tab, the Compensation Information tab, the Deduction Information tab, and the Taxes tab. 1. 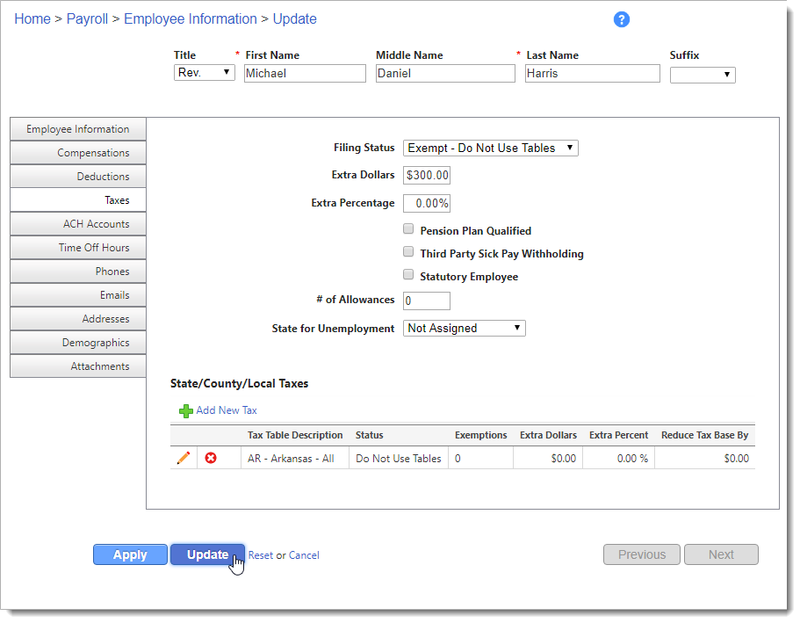 From the Payroll menu, Select Modify -> Employee Information. 2. Click the Add New Employee link. 3. The Person Search window appears. It is best to search for a record to avoid adding a duplicate. Enter the last name in the Name field and then click the Search button. 4. If you see the person listed on the grid, click on the person and then click the Select button. If you do not see the person listed on the grid, click the Close link so that you can add the person as an employee. 1. Check the Minister check box. NOTE: Selecting this box assures that this employee does not have Social Security or Medicare tax calculated. It also allows compensations that are marked "Minister Only" to be assigned to this employee. Compensations for a minister may include the following: Salary/Hourly (Regular Wages), Housing allowance to purchase or rent a home, Business expense reimbursements - nonaccountable\Cell Phone Allowance, Auto Allowance - nonaccountable plan, Life Insurance Premiums over $50,000, or Social Security tax paid by church. Refer to the Set up Compensations and Deductions tutorial or video if any of the compensations or deductions that pertain to this minister have not been set up. The following steps guide you through adding a Cell Phone allowance to the minister's record. 1. Click the Compensations tab. 2. Click the Add New Compensation icon-link. 3. Select the Compensation and Distribution from the drop-down lists. 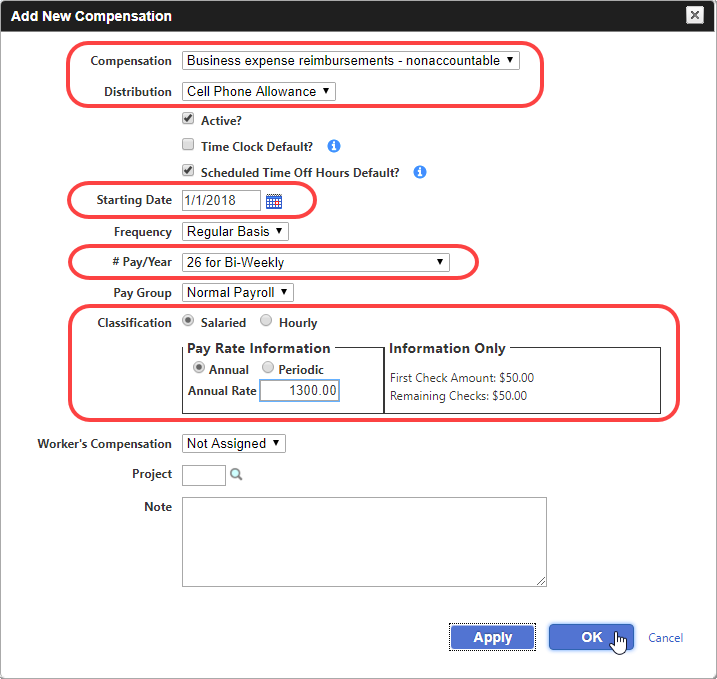 Assign the Starting Date for this Compensation to take effect and set the # Pay/Year that corresponds with your organizations pay schedule. Select any other options as appropriate and then enter the Pay Rate Information. Click the OK button when you are finished. 4. Continue adding other compensations as appropriate for this minister. When you are finished, review the compensations that have been added. It's not unusual for ministers to have a deduction for retirement such as a 403(b). In some cases, they may also have a deduction for a charitable contribution to the church. The following steps guide you through adding a 403(b) retirement deduction. 1. Click the Deductions tab. 2. Click the Add New Deduction icon-link. 3. Select The Deduction and Distribution from the drop-down lists. 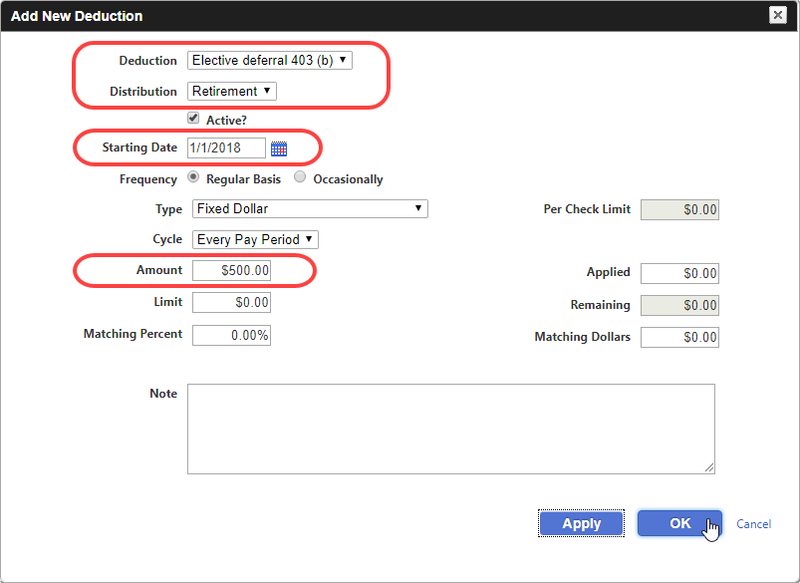 Assign the Starting Date for the deduction to take effect and then enter the amount (or percentage) in the Amount field. Select any other options then click the OK button. 4. Continue adding other deductions as appropriate for this minister. When you are finished, review the deductions that have been added. 1. Click the Taxes tab. 2. For Ministers, select the Filing Status of "Exempt - Do Not Use Tables" and then enter any Extra Dollars or Extra Percentage as appropriate. Enter any other tax information that pertains to this minister. 3. Next, click the Add New Tax icon-link under the State/County/Local Taxes heading. 4. Select the state where the minister is subject to pay state taxes (e.g. AR - Arkansas - All) using the Tax Table drop-down. Select "Do Not Use Tables" on the Status drop-down list. Enter any other information that pertains to this tax locale. Click the OK button when you are finished. 5. Repeat this process to add any other State/County/Local taxes as appropriate. When you are done adding information for this minister, review the information and then click the Update button to save the employee record. IMPORTANT NOTE: If you navigate away from this page without clicking the Apply or Update button, then all information added or modified on this employee is lost.